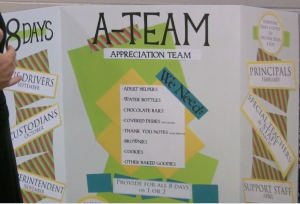 To get your Appreciation Program started right, line up your resources for the entire year in advance. Get your resources ready to go before your school year begins and enjoy the benefits of having several people involved in helping to make your appreciation days a success. On registration day, set up a table with 2 or 3 A-Team students inviting parents to participate in the program. Have the students ask parents to sign up using the sign up sheet we provide. Once you have all the parents signed up, the Action Team will call them throughout the year to remind them to send in the items for the appreciation day(s). That way “everyone does a little so no does a lot”. A goal of the A-Team is to engage as many people as possible in celebrating employees. A key to a successful Appreciation Program is the notion that everyone does a little so no one needs to do a lot. Obviously, the largest group that makes up your school’s “everyone” is the student body and its contribution can make for a hugely successful celebration. Send an invitation to student groups within your school such as the football team, basketball team, student council, FCA, band, etc. to be a part of the appreciation day celebrations. Choose a different one to participate for each day. It gives the opportunity for more students to be involved in celebrating the employees as well as makes the day more special for those being honored. Send an invitation to local community leaders to be a part of your Appreciation Program. From writing notes of appreciation to providing small tokens of thanks or lunch, those in your community can help to make your days extra special.